Last year, Marcos Baghdatis was the runner up at the Legg Mason Tennis Classic. Today, in the quarterfinals, the seventh seed and 2006 Australian Open finalist was cut down by Donald Young 6-3,7-6. Although this was their first meeting, with the success he’s had this week, Young was not intimidated by his opponent’s credentials. Young took advantage of Baghdatis’ dismal serving, 39 percent first serve, and converted the only break point donated early on in the opening set. However, the second game of the next set, on triple break point, Baghdatis connected with a winner. With Young dumping a return in the net, Baghdatis raced to a 3-0 lead. After finally holding serve, Young broke his adversary to get back on serve. Later, with Baghdatis’ forehand sailing long, Young secured double break point. With Baghdatis’ forehand crosscourt traveling wide, Young was at 4-3. Yet, by gifting a double fault and with a miscue on a backhand, Young faced triple break point. When the American’s backhand up the line found the net, the players were back on equal footing. As a result of a backhand volley winner, Baghdatis had two chances to break and capture the second set. But with his backhand return and volley off their mark, Young was at deuce. One more break point had to be wiped out before Young could send the set into a tiebreaker. The initial point went to Young as Baghdatis flubbed a forehand up the line. Subsequent to erasing Young’s mini-break advantage, Baghadtis double faulted. Eventually, the Cypriot squared the tiebreaker at 4 all. But when Baghdatis fumbled a backhand volley, Young was two points from the win. With a spectacular overhead winner and backhand error from his rival, Young clinched his first ATP semifinal spot. Baghdatis admitted that he was somewhat tired this afternoon after playing two matches yesterday which went the distance. The Cypriot felt that his energy level was low. The fact that Young kept him on the move was not helpful. With his serve inconsistent and Young “ playing smart”, Baghdatis said even if it had gone to a third set, he is not sure that his experience would have carried him through. 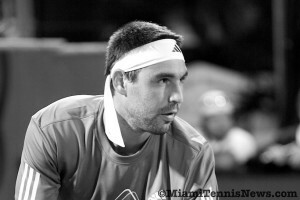 In reference to Young’s future in the game, Baghdatis stated that he’s “very talented, but it’s a tough world out there. . . [He] has to keep working hard and fight the way he did today. If he does. . . .he will have a bright future”. After the match, Young expressed that it’s thrilling to find himself in his first ATP semifinal particularly with victories over “the quality players. . . I’m very excited and hopefully I can keep moving forward”. Subsequent to obtaining the crucial break for 4-3 in the second set and dumping his serve at love, Young stayed focused. 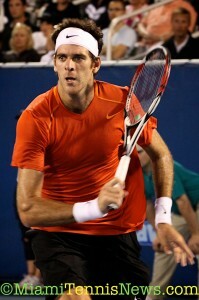 MiamiTennisNews.com inquired whether his current success is attributable to his mentally maturing. Young replied “for sure. Before, that would have set me off. But, [now], I try to look at the positive. . . Even though he broke back, I was actually still ahead . . .and could still close it out in two”. As far as his goal for the remainder of the year when asked by MiamiTennisNews.com, Young set the bar at breaking into the top fifty. For him, that would define a successful year. Next up for Young will be Radek Stepanek. Again, he will be clashing for the first time with a veteran. Young expressed “I’ve seen him play quite a bit and I don’t know what it will feel like on the court”. Nevertheless, Young opined that he will continue to do what he has been doing and hopes that will get him to his maiden ATP final. In many respects, the 2007 ATP tennis season can be summarized as a case of déjà vu, particularly where the grand slam tournaments are concerned. As he did in 2006, Roger Federer repeated at the Australian, Wimbledon and US Open while Nadal claimed his third consecutive French Open trophy. Majors aside though, Federer faltered throughout the year at the Masters’ Series, the second most prestigious competitions on the tour. At the Pacific Life Open, Guillermo Canas who entered the draw as a lucky looser, after a prolonged suspension from the sport for steroid abuse, provided the year’s first stunner by beating Federer in the second round, putting an end to the latter’s 41 match-winning streak. In so doing, the door was opened for Serb Novak Djokovic to make it to his first Masters Series final where he eventually lost to Rafael Nadal. A few months later, at the Sony Ericsson Open, Canas demonstrated that his prior win was not a fluke, lightning can indeed strike twice, he again eliminated Federer in straight sets, a tremendous feat considering that in 2006, only Nadal and Andy Murray had been able to register wins against Federer. 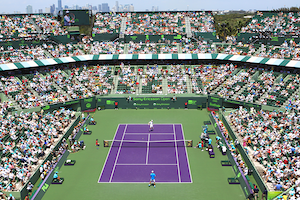 Moreover, the Sony Ericsson Open turned out to also be Djokovic’s coming out party; he exacted his revenge against Nadal by defeating him in the semifinals and went on to stop Canas from becoming the first qualifier to win the Ericsson Open, claiming his first Masters Series trophy. Without a doubt, Djokovic’s star was on the rise in 2007. He not only beat Federer at the Masters in Montreal, but also went on to make it to his first grand slam final at the US Open where he would prove to be a worthy contender before finally surrendering to Federer. In the last few years, tennis has been a tale of two surfaces while Federer has been king on grass and hardcourt, Rafael Nadal has been “Rey” on clay, and 2007 was no exception. Rafa extended his winning streak to 81 on the “terre battue” including titles in Rome and Monte Carlo before Federer was finally able to get the better of him in Hamburg at the finals. This unforeseen result fueled speculation that perhaps Federer might win his first French Open title; but such a prediction never materialized. 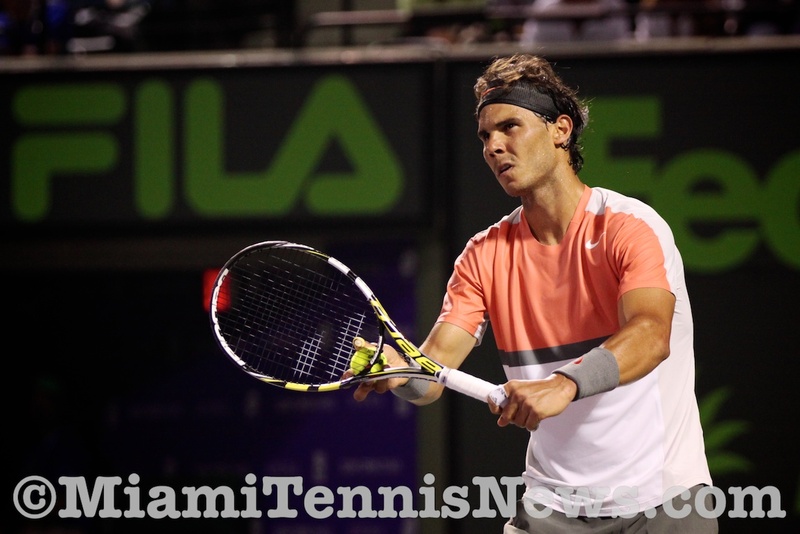 Rafa reasserted his dominance in beating Federer in the finals. Unfortunately, despite a strong stance at Wimbledon where he once again became a finalist, the remainder of Rafa’s season can best be described as lack luster. Plagued by injury, Nadal was unable to rack up another title, the only tournament final he reached, the Paris Masters, proved to be a debacle, a lopsided win by David Nalbandian. Therefore, it is safe to assume that the latter part of 2007 is a period that Nadal would like to relegate to the distant past. Besides Novak Djokovic, 2007 had some other nice surprises, primarily, the resurgence of a few so-called veteran players. For his part, at the tender age of 31,Carlos Moya, the former French Open champion, saw his rededication to the game pay off; posting his best results over the last several years. Moya reached the finals at the Medibank in Australia, the semifinals and quarterfinals on his best surface clay at Hamburg and the French Open respectively. Moya even demonstrated his competence on hardcourt by making it to the quarterfinals at the U.S. Open. Perhaps as is the case with the Spanish wine Rioja, Moya gets better with age. Undoubtedly, Moya’s fellow countryman, Ferrer, was one of the most exciting players to watch in 2007. Customarily, the Spaniards can be expected to do well on clay, but Ferrer surprised everyone when he beat Nadal on hardcourt on his way to earning a spot in the U.S Open semifinal where he eventually fell to Djokovic. A few months later, Ferrer returned the favor at the Tennis Masters Cup in Shanghai, easily defeating Djokovic as well as two other players to make it to the series final. For all his troubles though, Ferrer sealed a date with Federer who despite looking sluggish in the initial rounds of the event, managed to pull out yet again another victory. Another individual who decided the time had come to revive his game was Nalbandian; his recommitment was evident with a new fitness trainer and coach, weight loss translated to a renaissance of his powerful two-handed backhand along with spryness on the court. In the last few months of the year, Nalbandian’s game flourished, the reward was wins over both Federer and Nadal at the ATP Masters final in Paris and Madrid. Nalbandian has always been a difficult opponent for Federer, strangely enough, he is one of a hand full of players with a winning record against Roger. Thus, if he continues to work hard and improve, 2008 will prove to be an interesting season not only for him, but also for tennis fans alike. Regrettably, for those fanatical about American tennis, 2007 continued to disappoint. Andy Roddick failed to reach the finals of any of the key tournaments, his best showing was semifinalist at the Australian; while James Blake appears to be spiraling down, he did not make it past the fourth round at any of the grand slams. This leaves many to wonder when the drought of American champions will come to an end. Hope may lie with a young Atlanta teenager by the name of Donald Young, who decided to dabble in the adult league in 2007 while still playing on the junior circuit. In 2008, Young will probably join the ATP full-time, his inexperience will be a hindrance for several years, as impatient as Americans are, it is doubtful that their hunger for a consistent champion will be satisfied early enough. Regardless, all was not lost in 2007; team tennis was the brightest spot for the USA. After a twelve-year hiatus, the Davis Cup returned to its home on US soil, when the US convincingly defeated Russia. Probably, the biggest story in 2007 was for the shenanigans off the court; tennis was revealed not to be immune from an ugly aspect of professional sports, gambling. At times, one forgets that tennis is not just a game; it is after all a business. With so much money involved, there is no lack of temptation. Allegations of match fixing surfaced when one of tennis’s most prominent stars, Russian Nikolay Davydenko was accused of possibly throwing a match against a relatively obscure opponent. Eyebrows were raised when an inordinate amount of bets was being placed in favor of Davydenko’s adversary despite the fact that he had been pummeled in the first set. When the Russian retired in the third set supposedly due to a foot ailment, suspicions heightened that something illicit was afoot. Subsequently, a few players admitted to having been approached with the proposal of loosing matches for monetary gains. The investigation in Davydenko’s case is still ongoing, but the repercussions that this type of blemish may have on the sport are troubling enough to the ATP officials that a few months later an Italian player was temporary barred from play after he was found to be betting on matches. After taking a look back at the past year, it would only be fitting to peak into the tennis crystal ball and tread into the realm of forecasting what may unfold in 2008. As it turns out, the crystal ball appears cloudy; therefore, what to expect the upcoming season is anyone’s guess. The predictable question remains as to whether Nadal will at last relinquish the French Open crown to Federer thereby anointing him the best player the game has ever seen or as was the case with Pete Sampras will that trophy continue to remain elusive. What is undoubtedly clear in reviewing the events of 2007 is that the gap has been closing between Roger and the rest of the field; thus, Superman may be forced to come down to earth in 2008 and permanently reside amongst the commoners.